Ever since its revelation 1400 years ago, the Qur'an has been a book of guidance and inspiration, a reference point, and a rich source of social and moral dynamism for hundreds of millions of people throughout the world who believe it to be immutable word of God. Hardly a generation passes without a fresh attempt to unravel the meanings of the Qur'an and gain deeper insight into its universal message within a contemporary perspective. In The Shade Of The Qur'an is more than 'just another' commentary; yet it is not too over-reaching or outlandish to be a completely new interpretation. It is an earnest, sincere and sober look at man's contemporary achievements and difficulties in the light of the message of the Qur'an. It is an effort to vigorously explore its rich wisdom, and expand its invaluable guidance for the benefit of an increasingly 'sophisticated' , yet highly perplexed modern society. The work, which is by far Sayyid Qutb's largest and most profound, spans the whole of the text of the Qur'an. It was written, and partly re-written, over a period of more than 15 years, most of which the author had spent in Egyptian prisons, during the 1950s and 1960s. In it is embedded Sayyid Qutb's insight, highly esteemed intellectual vigor, and his widely-acclaimed literary prowess. 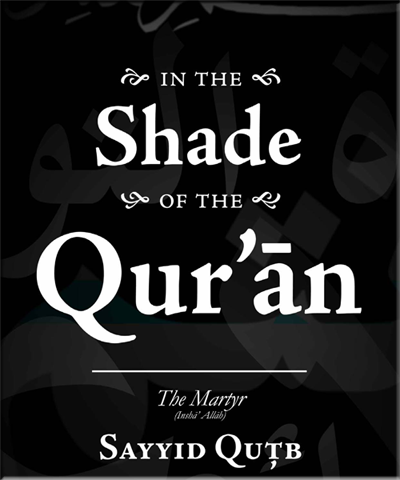 In The Shade Of The Qur'an has been universally recognized as an outstanding contribution to Islamic thought and scholarship, to which students and scholars, as well as contemporary Islamic revivalist movements all over the world, owe a great deal. Now that it is available in English, it will continue to enlighten and inspire millions more. It will take its rightful place as an indispensable work of reference for a proper understanding of contemporary Islamic thinking. 1906 : Born in the village Musha, northern Egypt. 1930's and 1940's: Qutb start working as a inspector of schools for the Egyptian Ministry of Education. He also tries to start a career as a writer, and publishes some books but without much success. 1948: Travels to USA on a scholarship to study the educational system, receiving a master's degree from the Colorado State College of Education. 1952: First volume of his commentary In the Shade of the Qur'an (Fi Zilal al-Qur'an) is published. There would be 29 more volumes to this work. 1954: He is arrested and sentenced to long imprisonment together with many other members of the Ikhwan. 1964: After 10 years in prison, Qutb is released. 1965: Is allegedly part of the planning of the assassination of President Gamal Abdu l-Nasser, and is arrested again. Adil Salahi teachers at the Markfield Institute of Higher Education, Leicester, England. After working for the BBC Arabic Service for several years, he worked for the Arabic daily, al-Sharq al-Awsat. He continues to publish many Articles in various Publications including , Arab News, and many Online Publications. . He has worked and translated most of thel volumes of Sayyid Qutb's commentary, In the Shade of the Quran .